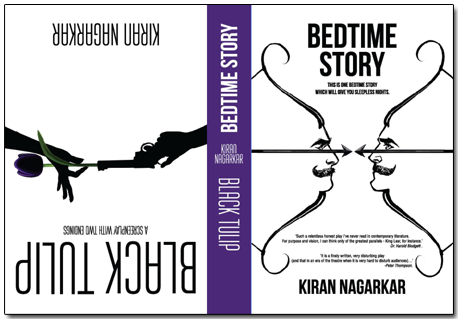 From the time I have started reading Kiran Nagarkar’s books, I have wanted to read the banned play, “Bedtime Story”. The play was banned when it first released in 1978 by the Shiv Sena and other fundamentalist parties. It has now been republished by Harper Collins India. For me the motive behind reading this book was only “Bedtime Story”. The screenplay “Black Tulip” did not hold much interest and yet when I started on that one as well, I was completely taken in by both – the difference in both is of another extreme but both are highly satisfying on different levels. “Bedtime Story” is based on the Mahabharata. It also has a modern angle to it which is riveting, real and quite thought-provoking. The premise of course will not change. However, Nagarkar manages to add elements which are so real even today, after thirty-seven years – the issue of caste, women’s rights, the political warfare, the debate of what’s right and what’s wrong, all of it has not changed at all. This just goes to show the society in which we live. We are a regressive lot and the sooner we admit to that, the better it is for all of us. There is then scope for change, I think. Nagarkar’s writing of “Bedtime Story” is so brutal and real that sometimes I just wanted to shy away from it. The truth, when stabbed always hurts a lot more than it normally would. “Bedtime Story” is delicious. It is snarky, holds a mirror to all hypocrisy and at the same time communicates what it wants to, without being modest or sugar-coating anything. On the other hand “Black Tulip” – a screenplay, starts off a little bland and then picks up pace. A woman renegade, her boyfriend and a cop in her top form battle against terrorism. The action takes place in the city of Bombay, bringing the screenplay to a brilliant end – with two probable endings actually. I would highly recommend this book to people who want to read something different – something real and also something imaginary. “Bedtime Story and Black Tulip” together are plays of endurance, of class, society, change and battle in one’s mind, heart and soul. A terrific read. This entry was posted in Books, Drama, Harper Collins India, Kiran Nagarkar, Review and tagged banned, Bedtime Story, Black Tulip, Controversial, drama, harper collins india, Kiran Nagarkar, Screenplay, the mahabharata on March 19, 2015 by thehungryreader.